Armenia is planning to increase defense expenditures by 25 per cent year-on-year, a draft budget for 2019 reveals. Addressing the September cabinet meeting, Finance Minister Atom Janjughazyan unveiled the proposed budget for the next year, according to which, the government will allocate AMD 307 billion (over $625 million) to the Defense Ministry. Of this sum, AMD 300.5 billion will be spent on military defense measures. What makes Armenia to increase military budget by a quarter? The Armenian government’s move to up the defense budget by almost 25 per cent in 2019 indicates that maverick Prime Minister Nikol Pashinyan remains loyal to the occupying policies of his predecessors and is determined to retain occupied Azerbaijani lands under control. This policy of poverty-stricken Armenia also harbingers unavoidable clashes for the de-occupation of the Azerbaijani lands. Nikol Pashinyan obviously has made up his mind to throw down the gauntlet to extend his power and stay loyal to his forebears’ policy of occupying foreign lands to turn them into devastation. 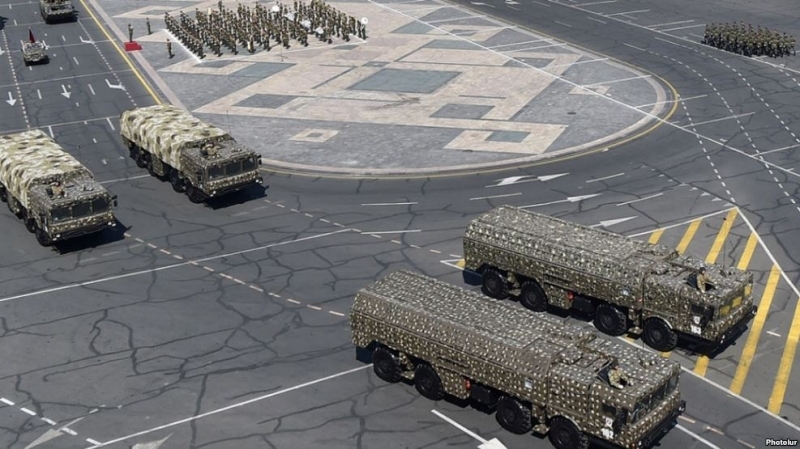 The defense budget earmarked for 2019 will further accelerate the arms race between Armenia and Azerbaijan and to further lead to an impasse, leaving no other chances for Azerbaijan than to unleash a military campaign. Even without the growth of the 2019 military budget, Russia has been providing its outpost with all modern weapons to keep under control and this is evidenced both by the rhetoric of the leaders and by the actively conducted purchases of military equipment. However, what is interesting is that what the sources are for about $647m dollars for the next year’s military budget? Armenia first increased sharply the military budget in 2018 after the brief flare-up on the front. At that time, it amounted to $518 million, 17.6% more than in 2017. This figure is not catastrophic, but by the standards of many countries, it is considerable - the same U.S. is fighting for the growth of military budgets of many NATO countries by only 2% of GDP. Further growth at this rate will be difficult - going beyond 5-6% of GDP is already quite dangerous for the country's economy, so it is worth expecting such high growth figures for a maximum of another 1-2 years, then it will be more proportionally tied to the growth of the budget itself, the report claims. In addition, it is necessary to note the Russian soft loans are playing a pivotal role in the growth of the Armenia’s military budget – so far two of them - the first by $200 million in 2016, the second by $100 million in 2018. Negotiations are underway for a third loan for another $100 million. At the same time, it should be noted that the growth for 2019 cannot be explained solely by growth due to a loan - it is likely to be of the same proportion as they were in the past two years. For example, the 2019 budget envisages the purchase of equipment at the expense of the Russian loan of $89.2 million (13.7% of Armenia's military budget). On the other hand, drawing parallels between the military budgets of Azerbaijan and Armenia, the report in vainly hopes that “the emerging crisis in the Azerbaijani economy from 2014, the devaluation of the manat and the decline in the level of the defense budget, which was $1.6 billion in 2018 with maximum of $3.7 billion in 2013, Armenia would manage to somehow close the gap, or reduce the gap in procurement of modern weapons. However, the report immediately changes tack and says “it is clear that even with the current growth in mind, it is a long way to reach the Azerbaijani budget, but the possibility of preferential purchases in Russia allows much more efficient use of limited funds”. Having these opportunities, starting from 2015-2016, Armenia purchased a whole range of modern military equipment - Iskander operational missile systems, Smerch multiple rocket launcher systems, Avtobaza signal intelligence systems, radio electronic systems Repellent (against drones), Infauna and R-325U, anti-tank missile systems Kornet-EM, etc. Armenia, under the second preferential loan, has already signed three contracts, one of them, most likely, for the supply of Tor-M2E short-range anti-aircraft missile systems, the report says. In addition, there is a great interest in the creation of fighter aviation in the armed forces of Armenia, in fact, such a decision has already been made by the Armenian leadership, which is confirmed both by official statements and information from sources at the Defense Ministry. To buy even a small first batch of four multi-functional Su-30SM fighters, Yerevan will need at least $120 million, even with maximum discounts, the price of an aircraft with some weapons and spare parts are unlikely to be below $30 million, the report adds. If in 2019, the signing of such a contract is planned, then it is logical that the budget had to be increased by about this amount and it increased). It is known that the funds for the purchase of fighters will be allocated not through a number of concessional loans, which we mentioned above. Anyway, the increases in the purchases of modern military equipment and, in general, the strengthening of the capabilities of the armed forces contribute to the consolidation of the truce and reduce the likelihood of a full-scale war between Armenia and Azerbaijan. In this sense, Armenia acts in the wrong direction, and Russian support for preferential loans will not contribute to the resolution of the conflict peacefully but add fuel to the fire and engulf the whole region unless official Yerevan renounces from aggressive policies and de-occupy Azerbaijani lands.